Macrolide antibiotics are of immense importance in the battle against bacterial infections today – even with the ever present rise of resistance. 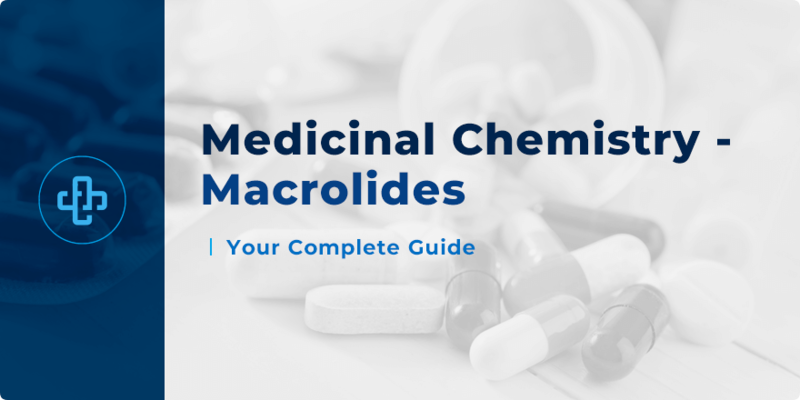 Here, we take a comprehensive glance at the medicinal chemistry of macrolides – a bacteriostatic group of drugs whose structure tells us much about how they work. Erythromycin is the first macrolide antibiotic discovered and put to clinical use. This compound was derived from soil samples from Iloilo, Philippines during the late 1940s by Eli Lilly researchers. Erythromycin is a metabolite of a strain of Streptomyces erythreus (now re-designated as Saccharopolyspora erythreus). Shortly after its discovery, erythromycin, then called ilotycin (named after the place of its discovery), was put to clinical use in 1952 – years before the chemical structure of the drug had been figured out. Back in the days of its discovery, degradation studies were conducted to elucidate the structure of erythromycin. Several years later, spectroscopic techniques gave researchers more information on the isolated metabolite. Erythromycin contains a 14-membered lactone ring and two sugars, desosamine (attached at C5) and cladinose (attached at C3). Erythromycin remains one of the most widely used macrolide antibiotics in clinical settings. At a glance, erythromycin is a rather structurally complex molecule. Nevertheless, organic chemistry groups have successfully managed to synthesise the compound. Due to its structural complexity and low yields, the total synthesis of erythromycin is not economically viable. Erythromycin, in clinical use, is generally derived from cultures of immobilised or free Saccharopolyspora erythraea. Structural modifications have been made to erythromycin to try and mitigate acid-instability and circumvent issues with its bitter taste. Semisynthetic macrolides such as clarithromycin, roxithromycin, and azithromycin have since been developed. Clarithromycin is prepared from erythromycin oxime. Roxithromycin is another semisynthetic macrolide prepared from an oxime derivative of erythromycin. As mentioned elsewhere, azithromycin contains a 15-membered lactone ring. A key named reaction in the preparation of azithromycin is the Beckmann rearrangement reaction. 15-membered ring macrolides that contain nitrogen are sometimes referred to as azalides. Both azithromycin and clarithromycin have enhanced acid-stability compared to erythromycin. The development of erythromycin-derivatives with improved ADME properties is an important area in the medicinal chemistry of macrolides. You may have gathered earlier that acid-stability appears to be an issue for macrolide antibiotics. Erythromycin is itself susceptible to acid hydrolysis. The mechanism for acid-catalysed degradation of erythromycin is shown above. C6 and C12 hydroxyl groups are involved in the formation of the ketal under acidic conditions, such as those in the human stomach. Degradation has been reported to occur below pH 6.9. As such, strategies such as functional group conversion, prodrug use, and/or the use of enteric coating are often employed. Anhydroerythromycin, a compound of low antibacterial activity, is the main product of acid-catalysed degradation of erythromycin. Can you suggest what ‘anhydro’ indicates? Structural modifications have been made to erythromycin to augment acid-stability, as is the case with clarithromycin. The key difference between erythromycin and clarithromycin is that the C6 hydroxyl in erythromycin has been converted to an ether in clarithromycin. Due to this modification, clarithromycin has greater acid stability than erythromycin. The other semi-synthetic derivatives, roxithromycin and azithromycin, also have enhanced acid-stability. Functional groups of the desosamine moiety have been modified to confer erythromycin prodrugs with improved bioavailability and stability. For instance, the 2′ hydroxyl group of desosamine has been converted to esters to give prodrugs such as erythromycin stearate and erythromycin ethylsuccinate. Acid salts of desosamine’s dimethylamino group have also been developed. Erythromycin lactobionate is an example of such a compound. We now turn our attention to another area of macrolide antibiotics – the ketolides. Ketolide antibiotics are erythromycin-derivatives characterised by substitution of the cladinose sugar at C3 to a keto-group and a carbamate group attached to the lactone macrocycle. Ketolides have been demonstrated to be active against erythromycin-resistant bacteria. The orally administrated drug, telithromycin, is currently the only ketolide in clinical use. Solithromycin is an example of a ketolide currently in clinical trials. Note that the pyridine ring of telithromycin has been replaced with aniline in solithromycin, and the imidazole ring in telithromycin has been replaced with triazole in solithromycin. Also note that the C2 hydrogen of telithromycin has been replaced with fluorine. Fluorine is generally used for the bioisosteric replacement of hydrogen. Such drug design strategies have been employed in drugs such as ezetimibe. The role of fluorine in medicinal chemistry has been described in greater detail elsewhere. Macrolide antibiotics serve as alternative antibacterials for those who are allergic to beta-lactams (β-lactam antibiotics), such as penicillins. Erythromycin’s spectrum of activity is reminiscent to that of penicillin, but in contrast to penicillins, campylobacter, mycoplasma, chlamydia and legionella are generally sensitive to macrolides. Armed with the knowledge of pharmacology and the medicinal chemistry of macrolides, microbiology and synthetic chemistry, researchers have been able to develop erythromycin derivatives with more favourable pharmacokinetic and pharmacodynamics profiles for clinical use. See the ‘introduction’ above for articles relating to both the medicinal chemistry and the pharmacology of macrolides. Telithromycin: The first ketolide antimicrobial.